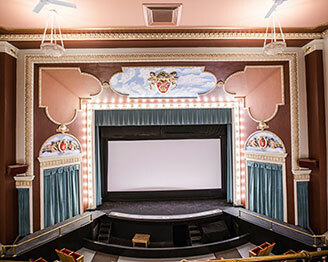 From vaudeville to surround-sound, from silent movies to major musicals, the Cresco Opera House has long served as the entertainment center for the greater Cresco, Iowa, area and beyond. 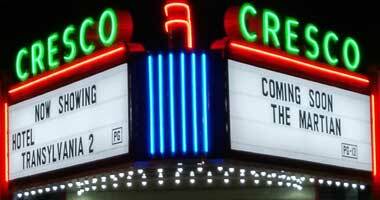 The architectural beauty has spanned the entertainment world from the early 20th Century into the 21st, and, thanks to the dedication of the people of Cresco, for many years to come. 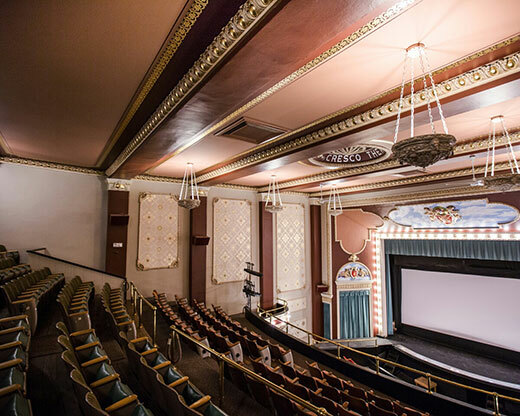 The Cresco Theatre was built in 1914 to replace Lyric Hall that had fallen into disrepair. Opening in 1915, the theatre embraced live entertainment but looked forward to the future by providing a projection booth to show movies. When it opened, there were wooden seats for 725 people divided just about equally between the main floor and the upper and lower balcony. These wooden seats were later replaced with cushioned seats, and today the theatre seats just over 425. The building was entered into the National Register of Historic Places in 1982. The building, located just west of the Howard County Courthouse, is 100 feet long and 47 feet wide. 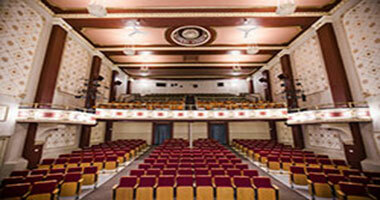 The stage is 47 feet wide, 20 feet deep, and the proscenium arch is 28 feet wide and 20 feet high. An orchestra pit fronts the stage, and there are two wing stages on both sides. There is a 25 foot by 15 foot green room under the stage. In 1999 a quarter of a million dollar exterior renovation of the building was completed as the entire structure was tuck-pointed, energy efficient windows installed, a new membrane roof was laid and energy efficient furnaces were installed. Two years later, the interior was updated with new carpet and an original design in gold leaf was applied inside the tapestry frames. Gold leaf also accents the cherubs along with the shields and rococo relief that is abundant throughout the auditorium. 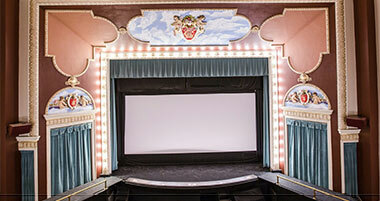 This includes the lighted proscenium arch and the front of the balcony. Cresco Theatre and Opera House has enjoyed a long history of live productions starting with the very first, 'High Jinks' in February 1915. We are fortunate to have Cresco Community Theatre supplement our entertainment schedule with several shows each year. Past performances included Little Shop of Horrors, A Christmas Carol, Pirates of Penzance, Alice In Wonderland, Peter Pan, Here Come The Brides, Arsenic and Old Lace, and Dracula, The Musical. 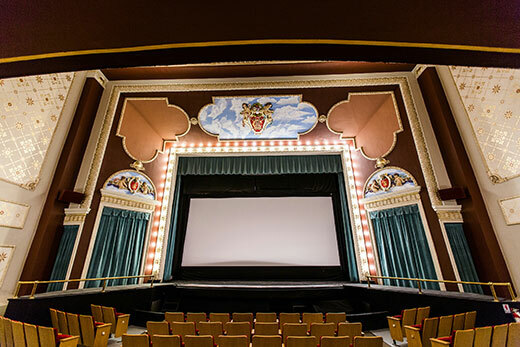 In 2014, the Cresco Theatre and Opera House celebrated 100 years with a year-long series of live shows and period movies. Movies included Singing In The Rain, Mame, Oceans Eleven, Casablanca, The Wizard of Oz, and The Wind. Live performances included Simon Estes, Lorie Line, Nelson Illusions, Late Nite Catechism: Changing Habits, and Monroe Crossing. The theatre is available to rent to individuals and groups for private and public events. 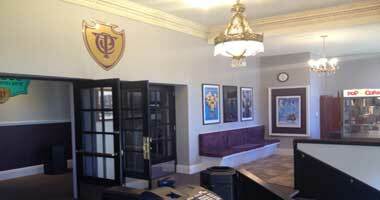 A completed rental application form and deposit fee must be submitted to the theatre manager. Upon approval by the Cresco Theatre Commission, the facilities will be reserved for the purposes and date(s) specified in the approved application. Only persons 18 years of age or older will be allowed to reserve the Cresco Theatre and Opera House. Sound and Light Equipment is owned by CCT and may be available to rent upon request. All requests must be made no less than 8 weeks prior to the event and will not be guaranteed until CCT approves the request.